Visions of Jesus Christ.com - Teresa Musco - Stigmatist. 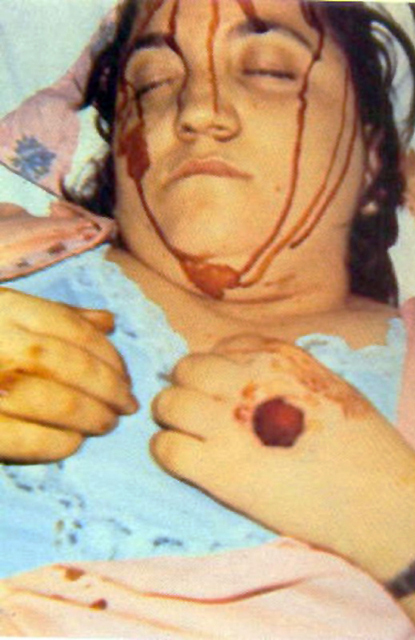 Above photos are of Teresa Musco with visible stigmata. [See/view] video titled Teresa Musco Bambino weeping tears of blood, Italy. [See/view] video titled Stigmatist Teresa Musco statue of The Immaculate Conception weeping tears of blood. Following excerpt is from [here]. A remarkable mystic & stigmatic who like Jesus died at age 33. Teresa Musco was born in a little village in Caiazzo (now Caserta) Italy on June 7th, 1943 to a farmer named Salvatore and his wife Rosa (Zullo) Musco. She was one of ten children, four of whom died during childhood, in a typical poor southern Italian family. Her mother, Rosa, was a mild-tempered and charitable woman, who always sought to obey her husband. Her father Salvatore, on the other hand, had a hot temper and was very easily angered. His word was law and had to be obeyed. The whole family suffered because of his harshness, especially Teresa, who was often at the receiving end of his cruelty. And Jesus' question "Do you love Me?" made a deep impression upon the heart of little Teresa, and her joyful reply was ‘Yes, yes, always yes!’ as she wrote later in her diary. Jesus was calling her to unite with Him for the conversion and salvation of sinners, and her "yes" drew her ever closer to Himself. To unite with Him, and be like Him, she would have to suffer and learn to sacrifice for others, and so began the painful, yet joyful mission as a victim soul that God had given to her. And not only was she guided by Jesus and Mary at a tender age, but also her guardian Angel who taught her to make sacrifices and to offer them in union with Jesus. On November 1, 1950 (feast of All Saints) Teresa went to holy Mass. Just before Mass began, a venerable priest approached her and said: ‘Child, I recommend that you pray for the souls in purgatory who have no one to pray for them.’ Teresa asked the priest his name. ‘I am Padre Pio,’ he answered smilingly. ‘Jesus told me to give you this news; one day you shall be like me. ‘Look…’ And, with those words he held out his hands and showed her the stigmata which he himself been given. He then blessed her and disappeared. As the years of her adolescence passed, there were many stays in several different hospitals and altogether she had roughly 117 operations, and because of this her body looked almost like a sieve, as she had holes, wounds and scars all over her sickly body. 'Will you help me to leave this cross for a while?’ On August 1, 1952 at age 9 Teresa was in a ‘deep sleep’. She found herself on a thorny path. There she met the crucified Jesus who asked her: ‘My little daughter, will you help me to leave this cross for a while?’ ‘Yes’, she answered at once. At that moment she felt herself grabbed by persons, who stretched her on the cross and nailed her to it. When Teresa awoke from her ‘sleep’, she suddenly became aware of painful wounds on her hands, feet and her heart. She was understandably frightened at first, but then she recalled the vision of Padre Pio who had showed her his stigmata, and had told her that 'One day you shall be like me'. This comforted her then she pondered the question of how Jesus could have chosen her; a poor simple peasant child. She considered herself totally unworthy, a ‘nobody’. But soon afterwards Jesus explained: ‘My daughter, I prefer to choose the humble, the meek and the lowly!’ After a few days the stigmata temporarily disappeared, only to return again in a few years time, as we shall soon see. And a few days later, Teresa saw in a dream many cursing, swearing people; from their eyes, ears and mouths shot hot flames, which immediately changed into ugly snakes. ‘After that dream,’Teresa wrote, ‘I was horrified at the thought that my father might become like one of those people in the eyes of God if he continued his awful swearing, so I told my father about that dream.’ The story of the 'dream' had an immediate effect and her father began to swear less often. Meanwhile, Teresa continued to pray and suffer for priests, the Church, the souls of the dead, the unchaste and for blasphemers. On October 15th 1963 at 1:30pm Teresa -now age 20- was alone in the house. There was a knock at the door and when Teresa opened it, there was a monk who said that he had come to bring her Holy Communion. To her it seemed that the monk was Padre Pio of Pietrelcina. After Communion, Teresa and the monk prayed together. Then he asked, ‘Child, do you want to consecrate your virginity to the Holy Madonna?’m‘Yes, I do’ said Teresa. She stated: ‘Jesus approached, took the crown of thorns from His head and with radiantly shining hands, pressed it on my head.’ It was truly painful, but she was very happy. She kept the crown of thorns for two hours, but from then on Teresa’s forehead was often seen to be dripping with blood. The first time it happened, was Feb. 26th 1975. Teresa brought a picture of Jesus from Caiazzo to Caserta. Whilst cleaning the picture, she noticed tears of blood running down Jesus’ face.n This was the first extraordinary sign.n The Archbishop of Caserta examined the picture and then granted Teresa through her spiritual director, Padre Stefano M. Manelli, writtern permission on Good Friday, 1975 to exhibit it on her little prayer altar in her home. As other pictures and even statues began to weep and bleed, sometimes she asked herself in confusion, ‘What is happening in my house? Every day brings a miracle, some people believe and others doubt the reality of the great events. I do not doubt it. I know that Jesus does not want to give any more messages in words, but in greater things…’ On January 1976, Teresa wrote this note into her diary; ‘This year started with so much sorrow. My worst grief is to see the pictures crying blood. As time went on, the phenomena happened several times each day. Statues, ‘Ecce – Homo’ pictures, crucifixes, pictures of the child Jesus, pictures of Christ’s Sacred Heart and pictures of the Virgin Mary and others shed tears of blood. Sometimes the shedding of blood lasted for quarter of an hour. Watching them, Teresa was often moved to tears herself and wondered, ‘Could I be the reason for these tears as well?’ or, ‘What can I do to soothe the sorrow of Jesus and His most Holy Mother?’ Surely also this is a question for each one of us. She soon felt her time was near and she longed to enter into eternal life with her Jesus. But, before she could do so, she had to finish her sacrifice; just like Jesus, the crucified victim, had done. During this period until the day she died, Teresa was cheerful, happy and keenly interested to finish her welfare work with old people, for throughout her life she had always cared for the wellbeing of old people, and especially for old priests who needed help and support. On the Eve of her death, August 18th, Teresa had the pleasure of meeting her spiritual father, Father Borra, and they planned the purchase of a house for old priests, and poor old homeless men. She seemed to be in a hurry to finalise the deal. And she was not wrong… The next day, although she was exhausted by painful headaches, she travelled from Caserta to the ‘Clinic dei Gerani’ for another treatment. During her journey she spoke a lot about the plans for the home for aged priests and the homeless men. Teresa was dressed all in white, and on her hands could been seen the stigmata which became a final testament to the life of a sacrificial victim soul who offered her life and sufferings in union with Jesus for the conversion of sinners and for priests.